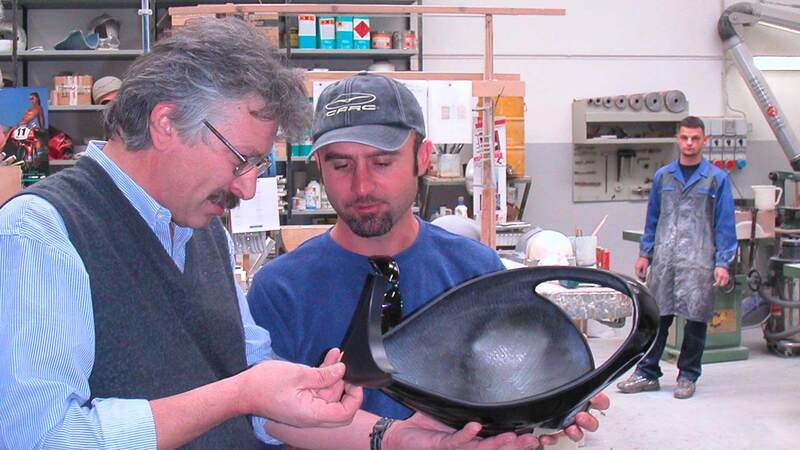 The 3 helmets were chosen by Ignazio Bernardi, our renowned designer and photographer. The result is a helmet with a very modern look. There are 2 shell sizes: a smaller version for head circumferences from 53 cm to 60 cm, and a larger version for head circumferences from 61 cm to 63 cm. The shell has a thickness of 3 mm. The density for the small shell is 60 grl and 70 grl for the big one. 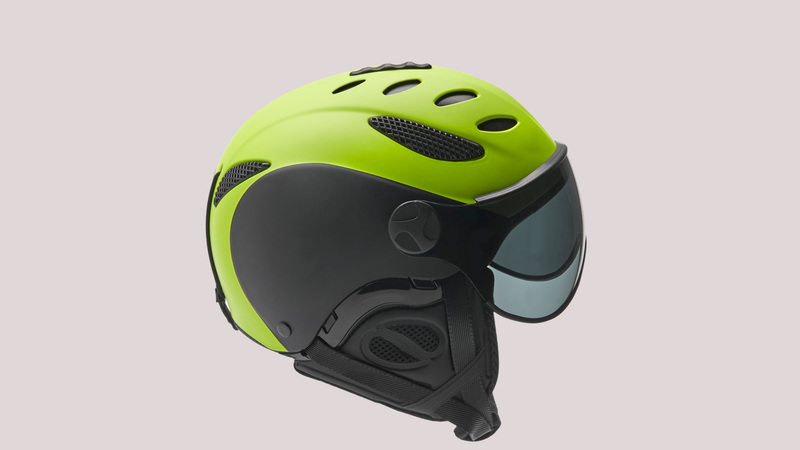 You can open or close the helmet’s 8 air vents using the central slide, with one hand only while you are skiing. The visor is an optional extra. It is made of polycarbonate with anti-scratch and anti-fog treatment. 4 versions are available: transparent, tinted grey, orange, mirror. 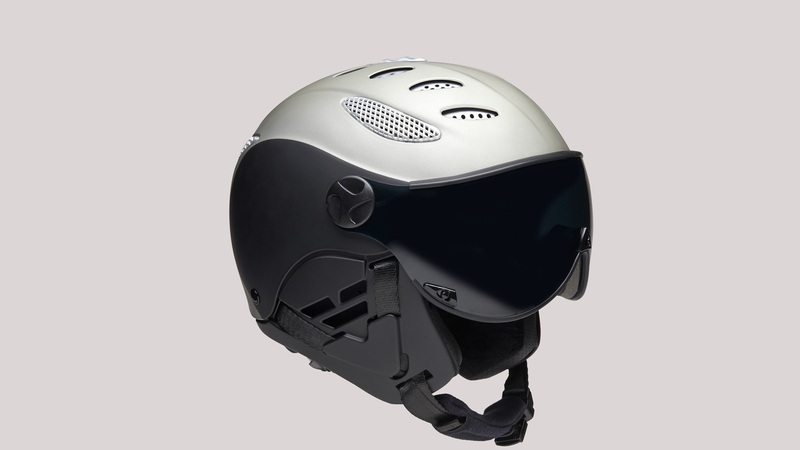 You can also apply a foam profile to the visor in order to reduce the entrance of air. The head-ring is flexible and can be adapted to all head shapes with a comfortable wheel regulator for a perfect fit of the head. There are 5 available sizes across the 2 shell formats. The size number corresponds to the head circumference in centimetres. In these helmets, the internal padding pieces are fixed and they cannot be changed. If you buy a helmet and you don't feel it comfortable, or it is not a good fit, we will replace the helmet with a new one. You just have to send back the original helmet at your own expense. We will then send you the new helmet free of charge. The internal padding is made of "Coolmax", a high-comfort fabric. The super-soft ear covers are easily removable. They are different for each model and sometimes they are accompanied by a different strap fabric. In order to optimize protection, we recommend always using the helmet with the ear pad protection pieces and never taking them off. The Nevo, Yello, Titan have been tested by the italian laboratory CSI, a company authorized by the Italian Ministry of Transport. 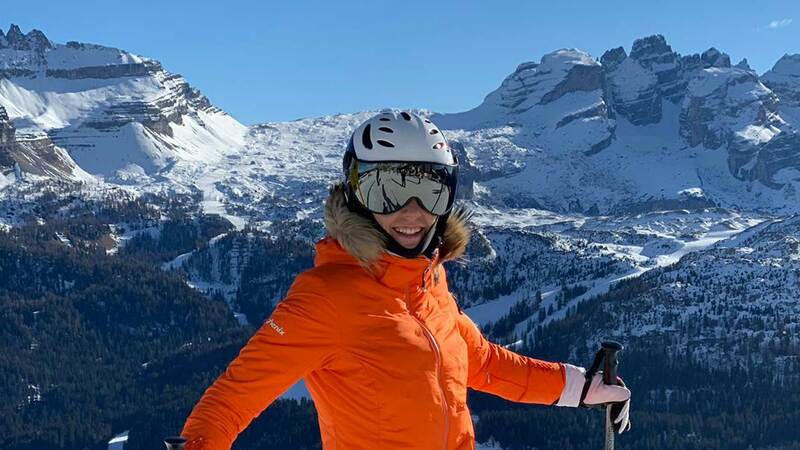 Our ski and snowboard helmets comply with the performance requisites specified by the technical standard EN 1077, which was our reference during the design process. All our helmets comply with the European Directive 89/686/CEE and thus bear the CE mark. This helmet is certified for Class B. 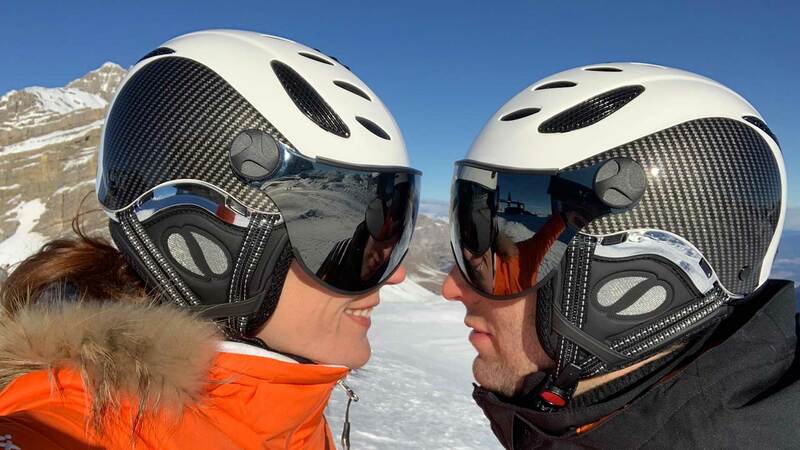 In accordance with this standard, the helmets are examined and tested for shock absorption, protection against penetration of sharp objects, resistance of chin strap and chin pad following impact, as well as other areas of effective protection. 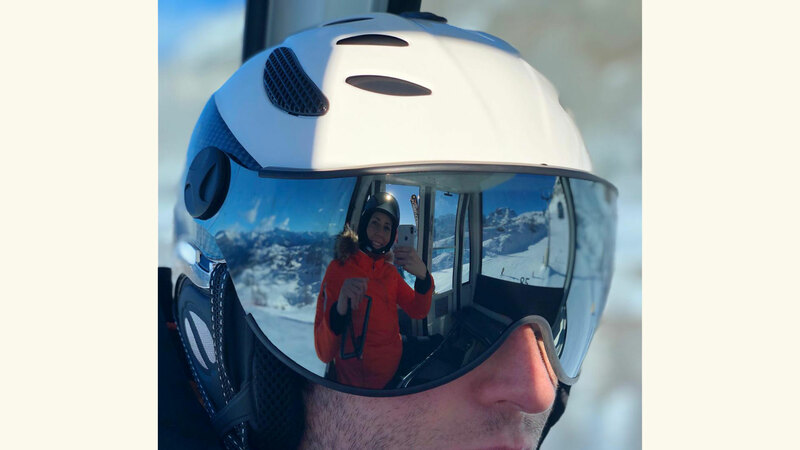 A Class A helmet provides high-performance protection for skiers and snowboarders, and its requirements are less restrictive. 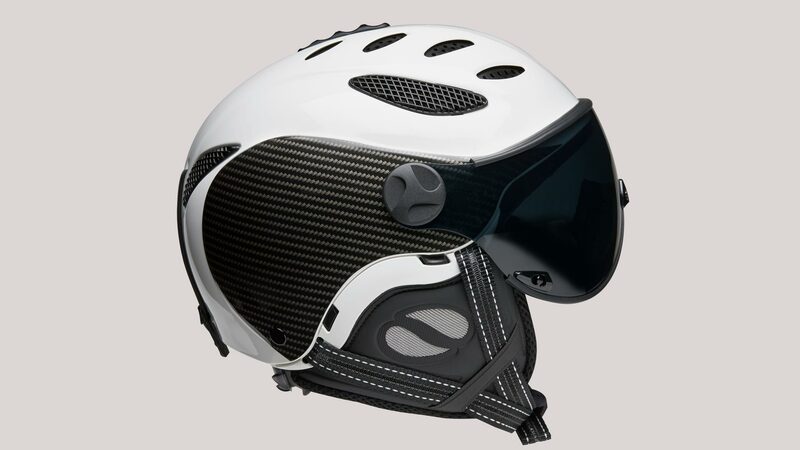 Therefore a Class B helmet offers a higher level of ventilation and comfort, without any reduction in performance characteristics with respect to the protection specifications in the standard. Visor 76 grams, with foam 87 grams.